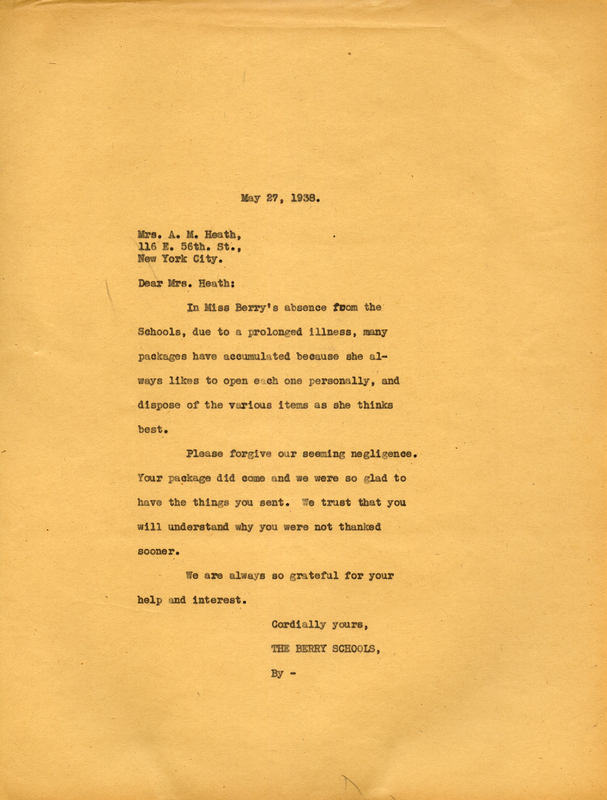 The Berry Schools write to Mrs. Heath apologizing for the seeming negligence due to Martha's illness to let her know her package did come and to thank her for the things she sent. Martha normally likes to open them personal. The Berry Schools, “Letter to Mrs. Heath from The Berry Schools.” Martha Berry Digital Archive. Eds. Schlitz, Stephanie A., Allison Moore, Aaron Jackson, Jessica Hornbuckle, et al. Mount Berry: Berry College, 2016. accessed April 24, 2019, https://mbda.berry.edu/items/show/14464.